How buying an eye makes a difference. Wearing one of our Wildlife Eye Collectible Pins shows that you are concerned about wildlife conservation and habitat preservation and gives you the opportunity to tell others how they can help, too! 25% of the profit on every sale goes directly to the wildlife conservation and habitat preservation organizations we support that are actively working to save the animals and their habitats for future generations around the world. Each one of our Wildlife Eye Collectible Pins features a full-color reproduction from the original miniature wildlife Eye Paintings by the cofounder of Eye Help Animals, artist DJ Geribo. 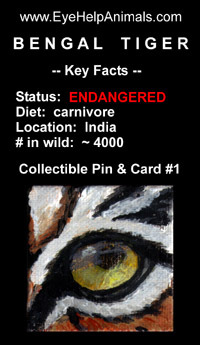 Each Wildlife Eye Collectible Pin comes sealed in a crystal clear protective bag with its own numbered card that tells about the particular animal's wildlife status, its diet, habitat, and the number of animals estimated to be in the wild. You can wear our beautiful Wildlife Eye Collectible Pins with pride knowing that each and every pin we sell helps to save wildlife! So, we hope that you will 'Buy an Eye' and please tell everyone you know about Our Mission and ask them to visit www.EyeHelpAnimals.com! Please consider sharing us with others!